Dr. David Kloth specializes in the diagnosis and treatment of complex chronic pain and has been practicing full-time interventional pain management since 1991. He is currently the section chief and Medical Director for Interventional Pain Management at OrthoConnecticut, a multispecialty practice with 9 offices throughout the state of Connecticut. 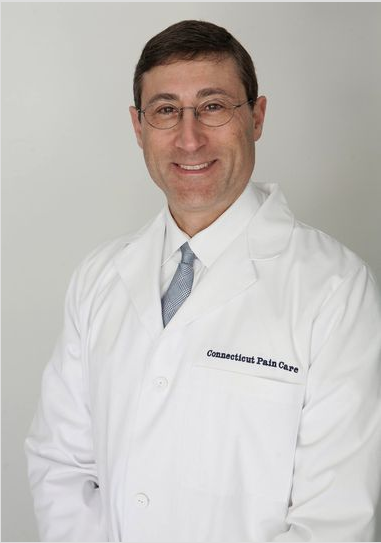 Dr. Kloth originally founded Connecticut Pain Care, now a division of OrthoConnecticut, in 1995. He began his career as a member of the Danbury Hospital Anesthesia Department in 1991, where he served as director of Acute Pain Management and helped to develop its Chronic Pain Service. Dr. Kloth’s full time clinical efforts are directed at the treatment of acute and chronic spinal pain and the non-operative treatment of musculoskeletal injuries. Dr. Kloth has been a national and local leader in pain management for more than 20 years. He frequently lectures at national meetings and regularly teaches physicians in training. He has co-authored numerous articles and a book for patients, Pain Wise. Dr. Kloth offers a full complement of interventional therapies including epidural injections, facet injections, SI joint injections, RF ablation, spinal cord stimulation, implanted spinal drug delivery systems, and minimally invasive lumbar decompression. He has been performing regenerative therapies since 1995 when he first trained with Gustav Hemwall, one of the fathers of proptherapy. Today Dr. Kloth offers numerous regenerative therapies including prolotherapy, PRP, Stem Cell, and placental tissue derived tissue treatments to help patients recover from musculoskeletal injury without the need for surgery. His education includes graduating from Union College in 1983 and medical school at New York University School of Medicine, where he graduated in 1987. In 1991 he completed his formal training in anesthesiology and pain management through the Hospital of the University of Pennsylvania. Dr. Kloth is an anesthesiologist by background and is board certified by the ABA in Anesthesiology with Added qualifications in Pain Management. He was the first physician in the state of Connecticut to be certified by the American Board of Interventional Pain Physicians (ABIPP). He has been active in many organizations nationally and in Connecticut. He is also a Fellow of Interventional Pain Practice through the World Institute of Pain. Dr. Kloth has served as President of two national medical societies, the North American Neuromodulation Society (NANS), and the American Society of Interventional Pain Physicians (ASIPP). He joined the board of the North American Neuromodulation Society in 2007 and continues to have an active role with the society as a Senior Advisor to the board and Co-chair of the Advocacy and Policy Committee. He served on the board of the American Society of Interventional Pain Physicians (ASIPP) from its inception in 1998 until 2014. In 2000, Dr. Kloth founded the Connecticut Pain Society and served as their President for 10 years, he continues as their Senior Advisor. He has previously served on the Carrier Advisory Committee for Medicare in Connecticut and has served on the Medical Advisory Board for Workers Compensation in the State of Connecticut for the last 15+ years. Dr. Kloth has worked for years with the Connecticut Workers Compensation MAB to help develop coverage guidelines for areas such as pain management treatments, opioid management for the WC patient, and urine testing. He is the co-author of multiple articles and helped co-author a book for patients and non-pain physicians, Pain Wise, in 2011 (available on Amazon, all proceeds go to ASIPP). Dr. Kloth lectures frequently at both national and state conferences and mentors young physicians on leadership roles and development. During his tenor on the NANS Board he has helped start and develop numerous projects including the Advocacy and Policy Committee, formal admission of NANS to the AMA, started a Residents and Fellows Section and helped promote the development of a Women in Neuromodulation (WIN) Section, began a legislative fellowship program, and connected NANS with multiple other societies through the Multi-Society Physician Workgroup (MPW). Dr. Kloth has been active in advocacy on both a state and federal level to try and bring effective change in a number of areas including expanded coverage for various different types of interventional pain treatments, reimbursement related challenges, state and national policy initiatives, and prescription drug abuse. Dr. Kloth has worked with state and federal officials to stop dangerous prescribing including through expert testimony. Over more than 20 years of advocacy work he has met with numerous federal officials and agencies including hundreds of legislators, CMS, HHS, DOE, FDA, and ONDCP in an attempt to bring about change on issues effecting pain management in the United States. rom 2009 until 2014, Dr. Kloth chaired the ASIPP and NANS Public Relations Committee to promote the field of interventional pain management and Neuromodulation and to specifically improve the public’s, media’s, insurance carriers, and government’s understanding of this evolving and complex field of medicine. He has been quoted on issues ranging from prescription drug abuse to healthcare reform in many major media outlets and has been seen on national TV and radio and quoted in various publications including the NYT, WSJ, and USA Today. Dr. Kloth has consulted as an expert for attorneys, the government (state and federal) and device manufacturers. He has testified as a medicolegal expert in personal injury, malpractice, and criminal matters. He also has entrepreneurial interests and has developed businesses in other medical fields including compounding pharmacies and mobile medical radiology repair and trucking.